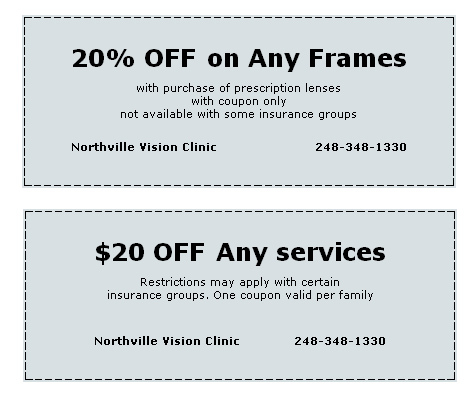 Northville Vision Clinic is a full service clinic providing eye examinations and all types of contact lenses including bifocal and astigmatism lenses. We have a large selection of frames including all brands of designer frames. Our non-prescription sunglass selection provides the best UV protection available anywhere. We have a full service lab that can provide one day emergency service in many cases. Our Staff of opticians have a combined total of 100 years experience. We provide comprehensive examinations for children as young as 3. We also provide caring and compassionate care for our increasing senior population by being a Medicare provider. The scope of Optometry has changed greatly in recent years. Our clinic is able to diagnose and treat a wide variety of infections to save you long and costly visits to your primary physician. 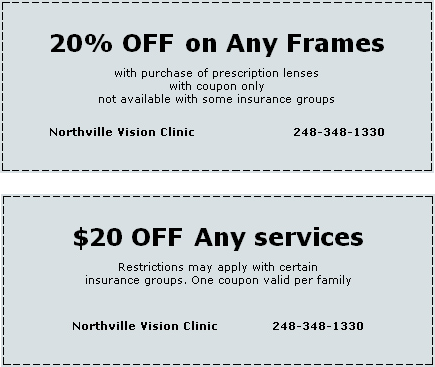 Northville Vision Clinic provides pre and post operative care for all types of laser surgery for Drs. Howard and Todd Adelson of Northville. Drs. Adelson are highly trained laser surgeons who have received the highest degree of training in the field. We have the most up to date equipment to allow our patients to receive the most advanced care available. Our retina camera allows us to see the entire retina with the utmost of accuracy. The clinic has recently added an automated refractor that will give us an accurate prescription while only asking the minimum of questions. We now have a retinal camera which is a low power microscope with an attached camera designed to photograph the interior of the eye, including the retina, macula and optic disc. The picture can be taken without dilating the eyes and gives us a permanent record to compare the health of your eyes from year to year. The camera aids in diagnosing diabetes, which is the leading cause of blindness. Additional eye related conditions that can be detected by using a retinal camera are glaucoma, macular degeneration, nevus, and hypertension. The retinal camera is a tremendous aid in providing the patient with the most comprehensive eye care. The most recent addition to our practice is an autorefractor. An autorefractor is a computer-controlled machine used during an eye examination to provide a prescription for glasses or contact lenses. No feedback is required from the patient in this process. The autorefractor gives us an extremely accurate starting point and minimizes “which looks better questions”. The feedback from the patient can help refine the prescription from the autorefractor. Autorefraction is particularly useful when dealing with non-communiative people, children and people with disabilities which limit their ability to refine a prescription.